If you’re new to the submitting process you might be racking your brain right about now on how to properly format your fiction manuscript. No doubt you’ve done a quick Google search and found a few examples or read a few books that talked about it and found that they all have slightly different things to say. That’s because the proper way to format your fiction manuscript is really up to who you are submitting it to. However, there is a basic guideline to follow so that in case you’re favorite publisher doesn’t post specific guidelines your MS won’t look like a big pile of …. Title: Centered 1/3 – ½ the way down the page in all CAPS. Word Count: Centered 1 double-spaced line below your name or top right hand corner of the page. ⇒ Tip: Pages are numbered continuously with page 1 being the first page AFTER the title page. Paragraphs: Indent the 1st word of every paragraph 1/2 in. (0.5″). ⇒ Tip: Use the format paragraph feature on your word processor and don’t insert extra lines between paragraphs. Space After Punctuation: 1 space. The End: Double-space and center the word “End” after the the last sentence of your story. Click on the following to see picture examples of a proper cover page and MS format. MS Word is the most common way to submit a document to a publisher; .doc or .rtf files will work. However, you need to clarify with the submission guidelines on what type of file they can read. 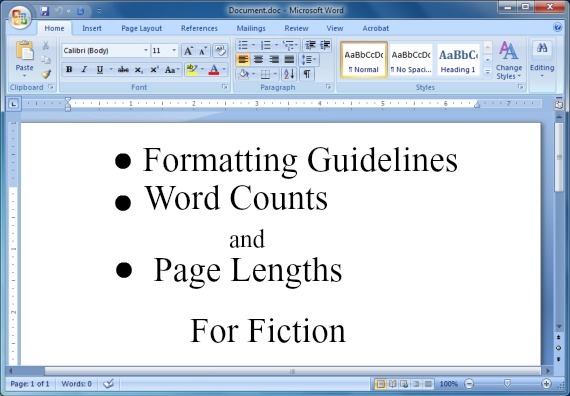 Now that we’ve tackled the basic guidelines for formatting your MS let’s dive into word counts and page lengths. For the purpose of this article I will be referring to guidelines for Romance and it’s sub genres. Before we get into the numbers lets talk about why page lengths and word counts matter. It costs money to print a book. Therefore publishing houses have a guideline of how many words or page lengths they will accept from an unpublished writer vs seasoned author. the amount of page and shelf space publishers are willing to risk. Books with a higher page and word count cost more to produce meaning more copies will need to be sold to see a decent profit. When you are starting out it is very wise to stick to the word and page count guidelines set by the publisher you are looking to pursue. The industry standard is 250 words per page. Surprise! We aren’t done. I decided to add a bonus part to this article that I’m sure you will appreciate. Below are links with extensive lists of publishers that handle romance. Listed along side the publishers names are links to their submission guidelines. Enjoy! Do you format your first draft or wait till you’re ready to submit it? Have you had a publishing house or agent ask for something different? Do you have a formatting tip to share? This entry was posted in Writing Resources and tagged #curvywriter, Darla G. Denton, Fiction, FirstManuscript.com, Harvey Chapman, Jess Michaels, Karen Fox, Killerbookmarketing, LiteraryRejections, Manuscript Formatting, Maryls Pearson, Novel, Novel Writing Help, Publishers, Romance, RWA, Submitting, WARA. Bookmark the permalink.